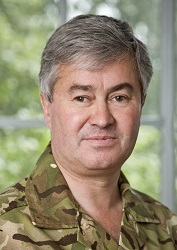 Promoting the Sandhurst leadership brand continues to be ‘core business’ . We were delighted to welcome General Sir Richard Barrons KCB, CBE, ADC Gen, Commander Joint Forces Command, to address a mixed audience of alumni and cadets. The General gave a frank and very informative presentation on the current security issues facing the country. While his subject matter was, by nature, high-level, he took great care to emphasise where newly-commissioned officers fitted into the strategic plan. In short, there was something for everyone.